between 03-06th of February 2019 at ISPO Munich. 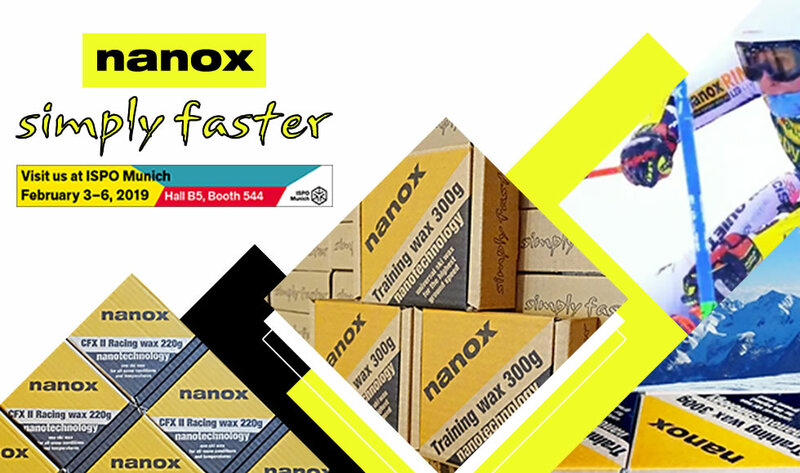 Distributors or retailers who are interested can contact the Nanox Team and request an entry ticket or book a meeting simply by sending an e-mail to info@nanox-wax.com. New! Special wax for extremely warm and wet conditions. For snow temperatures near 0°C / 32°F degrees. Top glide performance thanks to nanotechnology. 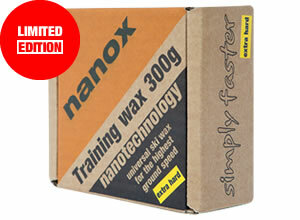 Nanox Supernano II 15 g for > 100 pairs of skis. 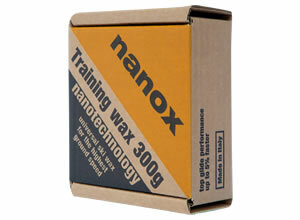 New!Extra hard training wax & base preparation for extremely cold conditions and high friction. Especially for Downhill and Super G.
Training extra hard 300g for 25-30 pairs of skis. to brush and polish Nanox waxes. 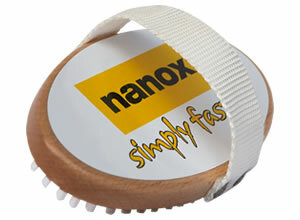 Superhard nylon brush for optimal polish of the Nanox waxes. The ultimate tool for edge finish. One tool two materials, diamond for deburring and sharpening the edge and a special magnet for cold forming and harden the edge. Plexi scraper for wax scraping. For all skiers and waxers. Sharp and effective. The technology of the future. The advantages of the nanotechnology in ski waxing are extreme long bonding with the coating and best gliding performance under all conditions, because of the nano particles' ability to adapt to different temperatures and conditions. Through the collaboration with analytical chemists from different countries specialized in nanotechnology and with their combined expertise we succeeded to develop Nanox ski wax. By now several World cup service tech and tuning experts of well known race ski manufacturers are using and testing Nanox wax and also our ski tuning machines. Hence, resulting a new input help us to further develop and improve our products. The December of 2016 marks the 20th anniversary of our company. It all started in 1996, when Horst Gamper has the idea to create a unique ski company whose products are significantly different from most product of that time, with high quality and top performance. So far, we have several successful brands and projects behind us. One of these brands is certainly Nanox. 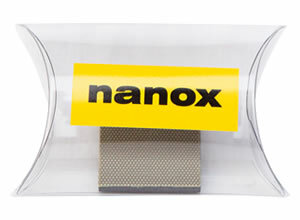 Today, Nanox is known for its unique products such as Nanox ski wax, skis and ski tuning machines. We look forward to many more years. Big thanks to our friends and loyal clients that have supported us over the years! We are a small company based in South Tyrol with 25 years of experience in the ski industry. Our goal is to be a leader in this field because we are the ones who can, know how and who are capable of doing this because it is in our blood. Thanks to the Alps where we were born we have combined our tradition and passion with modern technology. Our ski wax is stemmed from the heart of mountain as a value of many years of work and knowledge by people from our land. We are committed to give the world the true value ​​because we love what we do and because we are born on skis. Now Nanox products are everywhere around the world thanks to high quality, nanotechnology and experience that we have in ski business. We have acquired the know-how over many years of ski racing service at high level competitions and we invented and patented products such as binding plates V-TECH (Vist plates) which have revolutionized and dominated for nearly 10 years the Alpine Ski World Cup. Our vision is that in every country exists one Nanox ski center service point. So that the people can finally enjoy skiing. We offer only high-quality and high performance products. 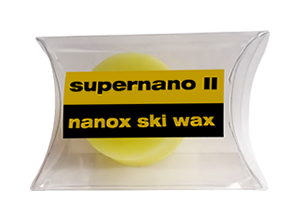 Nanox ski wax is one of the most used ski waxes in the world. Only one ski wax for all snow conditions and temperatures. Our ski wax is produced using renewable energy (green energy: photovoltaics). 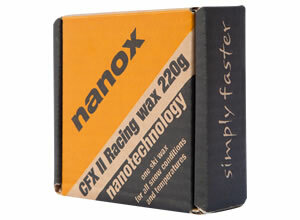 We are the first to use nanotechnology in the production of solid ski waxes. Tested and confirmed on the high level ski competitions all around the world. Used by: Alpine ski athletes, Snowboarders, Biathlon and XC Country skiers. Special high-tech ski tuning on the Nanox NC1 grinding machine provides optimal handling characteristics. This guarantees the best time in the race and maximum performance for every skier. Supersimple all in one ski grinding machine for high-end ski tuning. Nanox grinding machine in 220V version. Easy to use. It provides best grinding results. A place where you can get a highly professional service based on Nanox know-how. 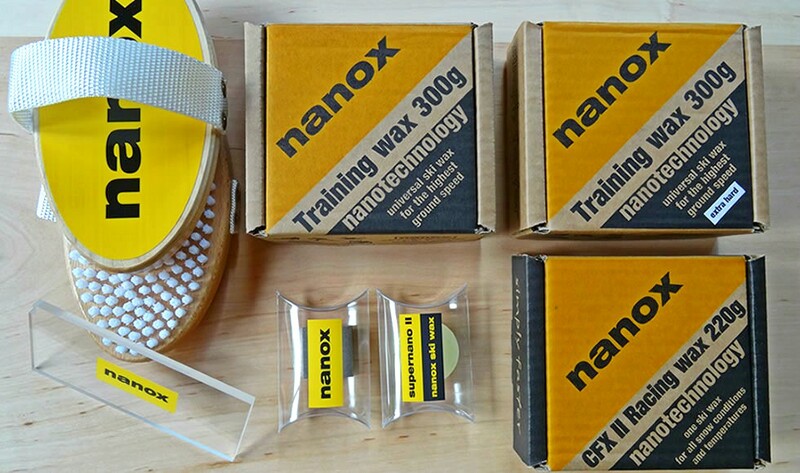 A place where you can prepare your skis, buy or test Nanox ski wax.